The Texas Auto Writer’s Association’s “2017 Activity Vehicle of Texas”, the Northwest Automotive Press Association’s “Outdoor Activity Vehicle of the Year”, and the recipient of ASG’s “Best Economic Performance” award, the 2017 Jeep Compass is an all-around astonishing compact SUV to consider as your next vehicle. To help you make your final decision, the team of experts at our Jeep dealership in Spearfish, SD have highlighted the features they think will most interest you. Read on to learn more about the interior, performance, and safety features available with the Jeep Compass crossover. If you have any inquiries before moving on to the article below, we encourage you to give us a call at (888) 280-6103 for answers from our automotive specialists. The 2.4L TigerShark® MultiAir® 2 I4 engine that comes standard with the 2017 Jeep Compass was designed to offer excellent torque and horsepower without sacrificing fuel economy. The available Selec-Terrain® Traction Management System, combined with the Jeep Active Drive Low 4×4 System, delivers outstanding on-road traction and Best-in-Class off-road performance. Take a look at the table below for details on the TigerShark® MultiAir® 2 engine’s specifications. Max. Towing Capacity 2,000 lbs. Test Drive the 2017 Jeep Compass in Spearfish, SD Today! Now that you’ve decided that the 2017 Jeep Compass is the right compact sport utility vehicle for your active lifestyle, the next step is to pick which trim package has the amenities you’ve been looking for. Stop by our trim package research page for more information or visit our new vehicle inventory to see all of the Compass models we have available at our Jeep dealership in Spearfish, SD. 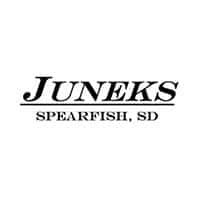 If you have any questions about our dealership or how you can schedule an appointment to come by, please don’t hesitate to contact Juneks Jeep using our online form. If you would prefer speaking directly with one of our team members, you can do so any time during our normal business hours by calling (888) 280-6103.